If Curves Could Talk: Dove ClearTone Deodorant campaign: Dare to Bare! Dove ClearTone Deodorant campaign: Dare to Bare! It’s a HUGE issue of mine. In fact, something I constantly worry about when I wear a tank top. With it being summer, it gets me worried even more! The irritation of shaving my underarms that often leaves dark spots! I am no stranger to this; in fact I try every deodorant under the sun that contains a moisturizer. In fact I have even gone DAYS without shaving, in hopes the dark circles would fade. 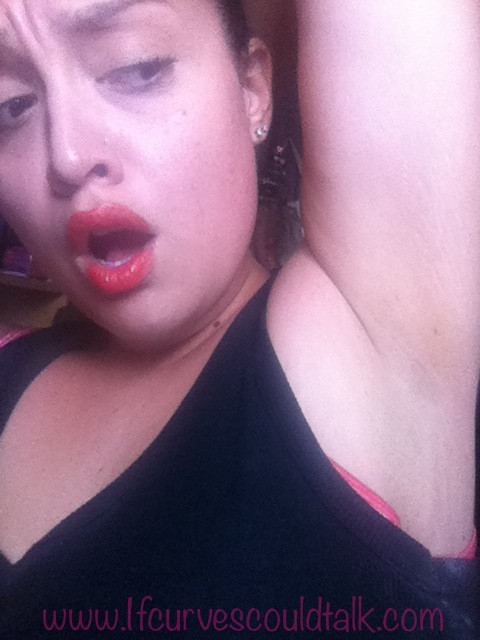 One, that did me no good, not shaving my underarms made me feel dirty and most of all not beautiful! Two, I tried EVERY remedy you can think of, from getting a cotton ball soaked in buttermilk, lemon juice , and have stayed o9out of the sun. My dark spots are not THAT bad, but bad enough to feel embarrassed. I know they have medicine out there; however, I didn’t go that extreme. So you’re probably thinking, “Stef, what are those remedies you listed above?” Here are TWO remedies I have tried: Buttermilk: Rub a cotton ball soaked with buttermilk on your underarms. Why buttermilk? Buttermilk contains a natural bleaching agent in it. Over an extended period of time, buttermilk can help fade the dark spots on your armpits. Lemon Juice: Just like the buttermilk remedy, Squeeze real lemon juice out of the fruit or pour about a half-cup of juice from a bottle of lemon juice into a bowl. Dip a cotton ball into the bowl and rub it into the dark spots on your armpits. Let the liquid soak into your skin. However, now that technology is MORE advanced, there’s Dove’s ClearTone deodorant! Dove’s ClearTone deodorant has a unique formula that moisturizes to accelerate the natural skin renewal process. It helps visibly reduce dark marks and even tone with regular use over time under your arms, all while providing 24-hour odor and wetness protection! Find out more HERE! I was compensated for this post by the Clever Girls Collective.com. All the opinions expressed here are my own. OOOOOOOOOOOOOOOH I want to try this now. Ahh, I have this problem too! I also get shaving bumps (arm area and bikini area)! I basically just have skin shaving problems, it makes me so so so embarrassed. Will have to look into this! Thanks Stef! I feel like a good exfoliation and cleaning before I shave always helps me avoid dark spots. I love that picture of you. Super cute!